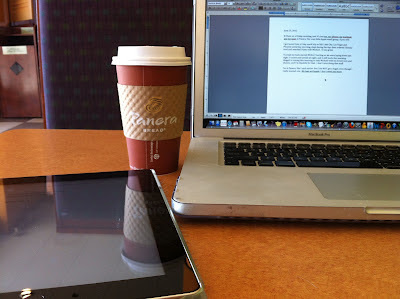 This post is brought to you by the Dark Roast and free internet at Panera Bread. I did NOT get a bagel, even though I really wanted to, because my legs are made of bagels and I don't need anymore, no matter what my taste buds think. This post is going to be random. Don't blame Panera. My back hurts. Ouch. I'll take your prayers if you can squeeze one more thing on your list. I have two standing prayer requests if you ever think of me: Pray for a strong back and good audio. Both are keys to success in my life. Thanks. I realized yesterday that I graduated from Indian River High School 15 years ago. For a second, I thought - dang, I am getting old! I remember when my mom had her 20th reunion. When I finally have a kid, they will remember my 50th high school reunion! Sometimes I feel so far behind in life. We don't have a house or kids, and looking at Facebook - it's like a never ending feed of new house pictures and ultrasounds. Sometimes I have to step away or my jealous heart really acts up. But, I think about how much love there is in my life, and my good health and prosperity when it comes to work - I mean I have had DREAMS come true over the last couple of years like nobody's business! and then I am truly thankful for the blessings in my life over the last 15 years. Speaking of anniversaries - tomorrow will mark 18 years since my husband broke his neck. 18 years paralyzed. That's insane, isn't it? That's a long time. His spinal cord injury could vote! I don't know how he does it. I think being paralyzed would get old in like oh, .5 seconds, but he rocks it out - day in and day out. He is my hero, in so many ways. I will never understand it, but I have finally given up trying to. I know everything happens according to God's will, so we will journey on, together. It's amazing how when you get married, the Lord takes your two stories and weaves them together as one, as he weaves the two people together as one. It's not easy - being woven like that - but oh, is it worth it! I am home for just a couple of days in between work trips. My brain is overloaded. I have so much to digest mentally. And with my back hurting - I guess I will have the chance to sit down and do that. If your news feed is clogged up with "Love Like This Life" updates over the next 24 hours - that's why. Yea! I would love for my feed to be clogged up with Love like this Life this weekend! I hope you feel better. I will pray for you. Girlfriend knows how to pray when it comes to backs. :) And may I suggest taking lots of ibuprofen? There's an anti-inflammatory in it that other pain releiver's don't have and it works the very best of all the over-the-counter's, imo, for spasms and achy pain. Here's what I'd say (not that you're asking :)-- take 3 tablets, at least 3 times a day...especially right before bedtime (or in the middle of the night) when things like to tighten up. Ok, moving on...you KNOW I'm raising my hand and nodding my head along with you about the facebook feed. Was there a nation-wide Barry White concert nine months ago or something?! Good grief. Hence, why I'm not on there too much these days. I hope you have a good weekend, and take care of yourself! Goodness, I read your post and got all blurry eyed, remembering 18 years ago when we heard about Michael's injuries. And then I think, what an amazing journey the two of you have had and what an incredible story God is writing through you. You are both heroes that I pray for every day . . . and consider that quite a privilege. Love you guys! Hello, I have enjoyed ready your blog and your love story it really hits home with me. My husband is a c 6, 7 incompete, and it was 17 years ago this month he had his accident too. We've been married 4 years and still going strong. I found you on apparalyzed site, and just wanted to say hello! @Kelly, thanks for following us. It seems like there are TONS of injury anniversaries right around now - I guess a lot of accidents happen in the summer time. @Bethany, I shared your blog on our Facebook page. Keep up your writing! It's from the heart, and really good. Hoping Billy feels A LOT better, SOON. @Kristen and @Diane - you guys are my most faithful readers and commenters and I just want to give both of you big, long, tight hugs. Thank you so much for all of your support! !